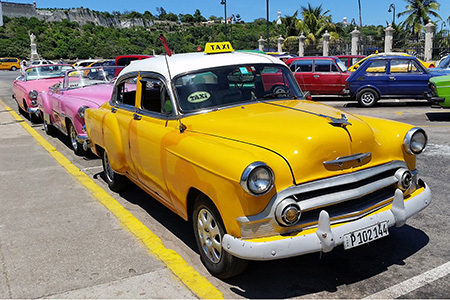 West Windsor, N.J. – There was something for everyone to embrace and explore during Mercer County Community College's (MCCC's) Study Tour to Cuba May 18-25. 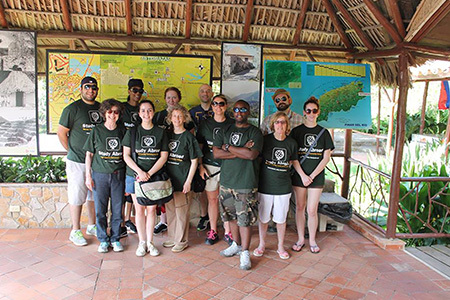 The itinerary provided MCCC students with insights galore into the history, music, art, food, religion, ecology, architecture, agriculture and politics of this once off-limits island nation. As Cuban relations with the United States improve, the ten students say they were grateful to be there at a time when the Cuban nation is on the cusp of change. And they note that every activity on their packed agenda provided yet another fascinating perspective on Cuban society. They and the two professors who accompanied them, Dr. Gianna Durso-Finley (Sociology) and Daniel D’Arpa (Spanish), agreed that the trip was the experience of a lifetime. 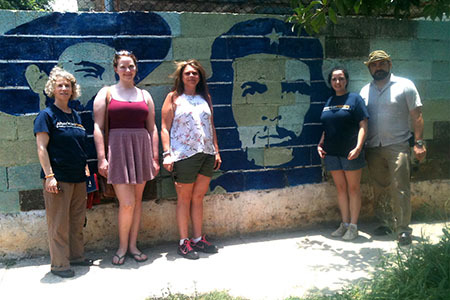 Among the highlights of the itinerary were a tour of the Workshop School, where high school graduates learn the art of restoring the ancient buildings of Old Havana; a presentation on U.S./Cuba relations by a professor at the Center for Hemispheric and United States Studies at the University of Havana; a visit to a Havana neighborhood that has been turned into a giant art installation involving local artisans and houses; and Las Terrazas, an eco-community located in the UNESCO Biosphere Reserve Sierra del Rosario in the western province of Pinar del Rio. Students also visited the Children's Academy of Baseball, elementary and secondary schools, a community health clinic, and a tobacco farm. The travelers had a chance to sit down and reflect on their newfound knowledge and perspectives at a debrief session on June 11. Several themes emerged from the wide-ranging discussion. One was an altered view of the Cuban form of communism. Sociology student Brendon Pearsall noted that Americans think of Cuba as a restrictive society, but that did not match their experience. “People were friendly and proud of their country, and they were happy to share with us. Even those in an official capacity were candid about the flaws in their system,” he said. Health care was of particular interest to Bridget Phelan, who earned her MCCC degree in Health Science in May and plans to next study nursing at Mercer. “They have a three-tiered system: the neighborhood doctor, the community clinic and the city hospital. The doctors know everyone,” she said. Pearsall added that health statistics are carefully tracked and Durso-Finley observed that health care workers are proactive and prevention focused. “They will knock on doors to give medications,” she said. With Internet access virtually non-existent, the students had to adjust to not being able to check their phones or Facebook accounts. For some it was a welcome relief. D’Arpa also appreciated a respite from the Internet. “It allowed us to get immersed in the culture. There is so much history and spectacular architecture to absorb. Havana is one of the most beautiful cities in the world,” he said, adding that his mother emigrated to the United States from Cuba so the trip took on a valuable personal dimension for him. Students also gave Cuba’s educational system high marks. School is mandatory through 9th grade and then students decide on an academic or vocational track. The university system is free and the government places graduates in jobs for two years in a type of apprenticeship program where they get paid a small wage. The crime rate is low and homelessness is virtually non-existent. Families live in multigenerational housing and there are no nursing homes. “The things we struggle with – student loans, health care bills and the acquisition of material possessions – they don’t have to deal with that,” Pearsall said. Indeed, Cuban food was a highlight every day. Eating in small cafes and traditional restaurants, students found that food was usually served family style in multiple courses. 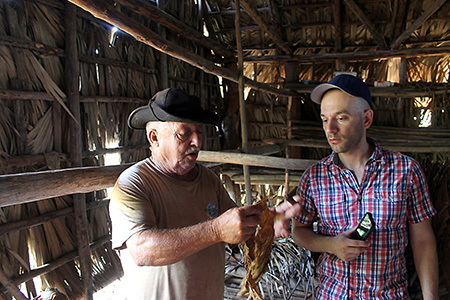 “Everything was fresh, organic and flavorful,” said Nejad, who also enjoyed Cuba’s world famous cigars. Professor Durso-Finley, a vegetarian, ate mounds of fried root vegetables, including yucca, a vegetable not typically found in U.S. markets. Rice and bean dishes were a menu staple. Cubans’ appreciation for their art and architecture was very much on display, including areas where murals were plentiful and beautiful old buildings are being painstakingly restored by artisans. “Their society, their arts, and their culture have thrived,” Phelan noted. So is life in Cuba simpler than in the U.S.? Students were careful not to impose American standards on what they experienced – as a good sociologist should, according to Durso-Finley. According to Durso-Finley and D’Arpa, the MCCC students could not have been better ambassadors for the college and the United States. “They were respectful to our speakers, they listened attentively, and they asked good questions. They were fully immersed in the experience,” Durso-Finley said. Study Abroad opportunities at Mercer include two paths to international education: a Semester Abroad and short-term, faculty-led Study Tours. Both take students outside the traditional classroom to learn about and experience world culture, business, history, art, science and more. Since 2010, the program has hosted Study Tours to Amsterdam, Costa Rica (three), Italy, London, Paris, Poland, and South Africa. To learn more about Study Abroad at Mercer, click here or email studyabroad@mccc.edu. Note: Photos used in this article were provided courtesy of Jennifer Vitella. 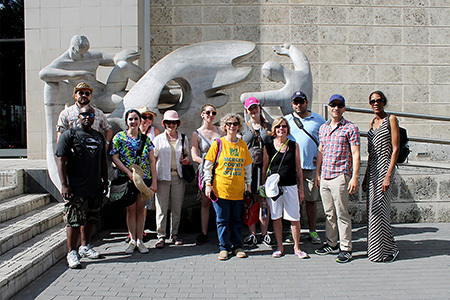 Outside the Art Museum in Havana, from left, Theodis Ratliff, Brendon Pearsall (back), Bridget Phelan, Jennifer Vitella, Virginia Kerr, Angie Barbush, Prof. Durso-Finley, Rachel Levitt, Barbara Costabile, Roham Nejad, Prof. D'Arpa and LaTanya Richardson. 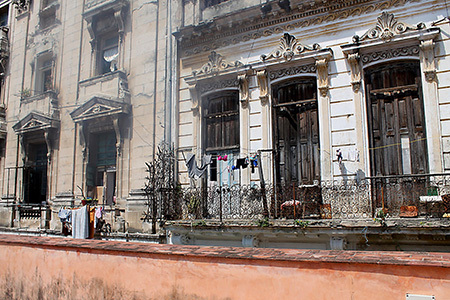 The beautiful architecture of Havana homes is on display everywhere. Many taxis and other vehicles are old, but still running! While visiting the Escuela Taller (the Workshop/Restoration School), students heard from its director. 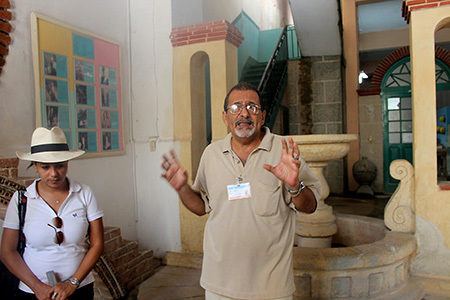 Pictured at left is Raydali Perez, who served as the group's tour guide throughout the trip. 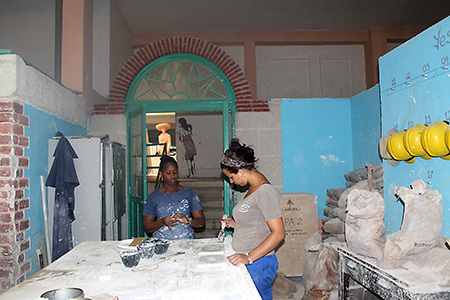 Students watched many artisans at work at the Escuela Taller. Murals depicting revolutionary figures are common. Pictured, from left, are Professor Durso-Finley, Rachel Levitt, Jennifer Vitella, Bridget Phelan and Brendon Pearsall. 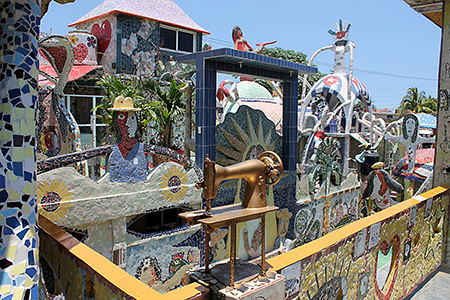 Artist Jose Fuster has turned an entire Havana neighborhood into an art installation. 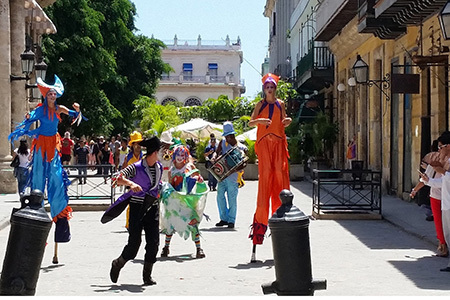 Street performers are part of the scene in Old Havana. View of the Vinalas Valley. 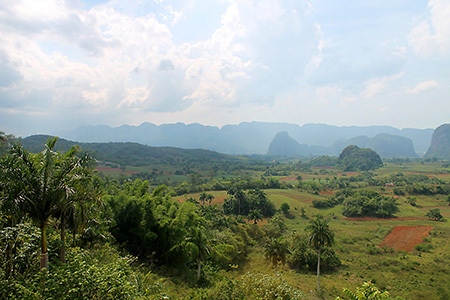 Cuba's rural lifestyle was the focus of the final days of the trip. Pictured at the Welcome Center at the ecologically sustainable community of Las Terrazas are, front row from left, Virginia Kerr, Bridget Phelan, Professor Gianna Durso-Finley, Jennifer Vitella, Theodis Ratliff, Barbara Costabile and Angie Barbush; back row from left, Roham Nejad, LaTanya Richardson, Rachel Levitt, Professor Daniel D'Arpa and Brendon Pearsall. A tobacco farmer explains his harvesting process.